How do you know if a relationship will last, or if it will even begin? When consulting astrology about a romantic relationship, most people want to know if it will develop into a significant, long term union. The underlying question is, “What kind of an impact will I have on the other person?” While there are no guarantees, the following are what I believe to be the top five synastry aspects which strongly indicate that a serious relationship will develop. All five don’t have to be present, but the more aspects there are, the stronger the draw is between two people. The rising sign represents a person’s interaction with the outside world. 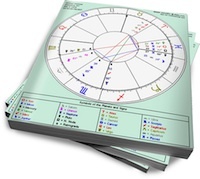 The planet that rules the rising sign (the chart ruler) shows how they express this interaction, and a connection between the chart rulers of two people is the hook that draws them together. Really good article! I could not help and and follow the steps you presented in your post and checked the synastry with one of the most important relationships I had in my life. We had Sun contacts, planets conjunction in the 4th house and Saturns that were exactly trine. It shows that synastry can also be used to understand important relationships that are not romantic. Although it started that way, this particular relationship evolved very quickly to a transformational relationship that helped me grow and mature by leaps and bounds in a short amount of time. There were many additional indicators of strong ties between us (same ascendant, north node position) but the lack of many harmonious contacts between personal planets (mars, mercury and venus) made the romantic side fizzle early on. What I got instead was a more mature and far less romantic view of relationships hat has served me well since then. I agree completely with your post…. even though there is some overlap, for the most part synastry contacts for longevity and impact are in a different category then compatibility and romantic sizzle. Great article!!!! Question, though. My Saturn conjuncts a guy I am madly in love with personal planets, Sun, Mercury & Mars. His Saturn opposes my Sun, Mercury and Venus. So does that mean I am more commited than he is? It is starting to feel that way. Unfortunately I do not have a birthtime for him so analyzing houses and angles is tough. Good question. Saturn oppositions in synastry can be tricky because the Saturn person can feel threatened by the energy of the planet person. In some way your guy feels that the parts of you represented by your Sun (ego), Mercury (communication) and Venus (femininity and way of showing your love) are “too much”. He may hold you at arms length in an attempt to control these energies. The planet person may interpret the Saturn person as being cold and distant. Look at what sign his Saturn is in and what aspects it makes to his planets for some clues on how to work with this. This will tell you how he integrates (or doesn’t) Saturn’s energy into his life and any issues he may have with control/authority/boundaries, etc. Oh my gosh, that is it EXACTLY! He holds me at arm’s length and I feel he is cold and distant. I always thouhgt it was his Cap moon that did that. His Saturn is in Aqua, his Sun/Merc/Mars are in Pisces, Venus in Taurus, Jupiter in Aries. Not sure what affects this has on him. I’m a newbie at this! Awesome article!!! I’m about to do some chart comparisons right now lol… question: what do you think about composite charts? For example, if a couple has great synastry but their composite chart is 50/50, which of the two would have the most revealing description of the relationships possibilities? Thank you! 1) from the info you’ve given me it sounds as if Saturn is one of the dominant planets in his chart (Saturn rules Capricorn and is the co-ruler of Aquarius). What I mean by co-ruler is that the traditional ruler of Aquarius was Saturn before Uranus was discovered. Anyway, this means his Saturn is strong in the sign it’s in and, combined with his Capricorn Moon, he will be drawn to boundaries, structure, control, etc (despite his planets in Pisces). Synastry draws you together and the composite chart keeps you together. That’s a very simplistic way of saying that the composite chart indicates how the relationship will develop over time. The longer two people are together, the stronger the influence of the composite chart. Even the most outstanding synastry cannot make up for a horrible composite chart. On the other hand, if the syanstry is iffy (but strong enough to pull two people together) it’s possible that a really solid composite chart can keep the relationship going. But the synastry has to be strong enough to draw two people together to begin with. The most amazing composite chart will never see the light of day unless the synastry works. Thank you again for your insights. They really do reflect his actions. But I am not sure what you mean by check his Saturn aspects to his venus/moon. Don’t all planets aspect another, whether it be a sextile, trine, etc? I also noticed that at the time of the first meeting his progressed sun conjuncted my antivertex. I read somewhere that is supposed to be significant but is it and for whom? On another note I think your commemts to PensiveGemini helped, as well. Our synastry is good but our composite horrible, no matter what birthtime I use for him. Lots of squares and oppositions. Some trines and sextiles but not even they are that great. The chart is one mystic rectangle after another. Doesn’t that signify fate at work? depending on where/how you got your charts done there should be a list of aspects between the planets. All planets do not aspect each other. Aspects are dependent on the number of degrees between the two planets. It’s possible his Saturn could square his Venus but only if they are a certain number of degrees apart. For example….if his Saturn was at 1 deg. Aquarius and his Venus was at 28 degrees Taurus they would too far apart to make any aspect to each other. If his Venus was anywhere between 1 and 6 deg. Taurus it would considered close enough to his Saturn at 1 deg. Aquarius to make a square. It’s probably easier for you to get a list of aspects generated for his chart…. Antivertex contact: probably more significant for you then him. I wouldn’t place it too high on the list of significant contacts. Basically the anti-vertex is the point directly opposite your vertex. The vertex is considered by some astrologers to be a point in the chart that signifies fated happenings. Composite mystic rectangle: I wouldn’t say that by itself indicates fate is at work. The mystic rectangle is simply a particular pattern formed by the planets in the composite. I see, then in that case according to two sites his saturn sextiles his venus but makes no aspect to his moon. In my experience, the Rising Signs of the couple themselves plays a very important role, as do connections between the Sexual Planets (Venus, Mars and Pluto) and as well, looking for the classic Sun-Moon conjunction. What you wrote about the Asc rulers and Saturn links is something I can fully get behind; all the other stuff, not so much. I am not so sure about this whole Sun-Moon conjunction. I am sure there is weight behind the assumption but I had this with a man whom I was with for 17 years and after the first few years the passion was just dead and quite frankly the aspects of my Sun I saw in his Moon drove me nuts and not in a good way. I stayed way longer than I should have out of ease and convenience but I that is not the reason to stay in a relationship. If there is no passion left then the relationship is dead, regardless of a Sun-moon conjunction. I have more passion and intensity of feelings with the Pisces man I wrote of above than I EVER had with the other man and we have very few helpful aspects and no Sun-Moon aspects at all. MU: It is NOT an “assumption”. Carl Jung verified this aspect with a study he conducted on hundreds of married couples of longstanding; the most common aspect? Sun-Moon conjunctions going accross the charts. MU: Hmm, it sounds like you two went quits shortly after the all-important Saturn opposition. This harkens back to what Nadia said above and which I readily co-signed, that Saturn is a very important planet to consider in longterm relationships and/or marriage-please note that Saturn is exalted in Libra. This suggests to me that you two had Saturn issues of one kind or another. LF: and quite frankly the aspects of my Sun I saw in his Moon drove me nuts and not in a good way. MU: The Moon is a reflector, so that makes perfect sense. One of the purposes of relationship is to learn about yourself through your mate, which acts as a catalyst o grow as both a mate and as a person. It would appear, that things didn’t go so well for you in that regard. LF: I stayed way longer than I should have out of ease and convenience but I that is not the reason to stay in a relationship. MU: Says who? Ease and convenience are just as legitimate as “passion”, it all depends on the couple(s) involved. I don’t think there is any hard and fast rules in this regard here one way or another. LF: If there is no passion left then the relationship is dead, regardless of a Sun-moon conjunction. LF: I have more passion and intensity of feelings with the Pisces man I wrote of above than I EVER had with the other man and we have very few helpful aspects and no Sun-Moon aspects at all. MU: Well, that all depends on what “helpful” means, hmm? If you’re so inclined, please post up you, your ex’s and your current beau’s charts, and we’ll see! Well for me personally I need passion. Maybe it’s my leo stellium or my Venus/Mars conjunction. If the passion is gone for me then it feels more like a brother/sister relationship. That might very well work for many couples who have been together a long time but not for me. Anyway, I appreciate your willingness to take a gander at the charts! Here is the first, the long term relationship with the Sun/Moon conjunction. Actually, there is no true conjunction value wise, just in the same signs. A lot of the favorable aspects here just did not apply to us. Here is the second chart for the Pisces man for whom I have an unexplainable affinity. I do not know his exact birthtime unfortunately. PLEASE I would love your insight on this one especially! Yea, I’d say that a Leo cluster of planets and a Venus-Mars conjunction would be important considerations. Tru dat. I’ll be happy to give you my astrological opinions of you/your ex and you/your current beau’s synastry if you’d be willing to post the birthdata for all parties involved. I’m used to using my own software and the charts they generate. Thanks! Pisces beau 3/9/1964 not sure of birthtime Norristown, Pennsylvania. Before I begin, I wanted to point out that you don’t have a Venus-Mars conjunction, per the data you gave me; your Venus is in early Leo and conjunct the Asc ruler Mercury (you have Gemini rising at 23 degrees), and your Leo Sun is at 24 degrees-three planets in any one Sign is indeed a stellium, but they aren’t “packed tight” together, so to speak. Your Mars is in Cancer and conjunct Jupiter, and together they form a Water Grand Trine with Saturn in Pisces and Neptune in Scorpio. Just wanted to clear that up. All it took was a quick look at your ex’s chart in relation to yours to see why things wouldn’t last and happily at that-for one thing, the rising Signs are all off. You have Gemini rising, which is a far cry from his Capricorn rising; that your ruler of the 7th, Jupiter, is in the same Sign as his 7th house, Cancer, and that his Leo Moon is in the 7th house and matches your Leo Sun, Asc ruling Mercury and Venus, kind of acts as a “workaround”, but in the absence of more substantial links, we all know how that ended. His chart ruling Saturn, at 20 Aries, does trine your Leo Sun (see Nadia’s article above), and, in that its in the same element family as your chart ruler Mercury, this again kind of acts as a “workaround”, but again, there’s no strong links that we would expect to see of a couple. His early Leo Moon does conjunct your Asc ruling Mercury and Venus, important considerations, and again we see a “workaround” in that your Sun is in the same Sign as his Moon. However, we have to note two things on this score: his Moon is some *23 degrees away* from your Sun, and, classically, such conjunctions work at their best when the *man’s* Sun conjoins the *woman’s* Moon. Put this together with the fact that there’s no sexual planet synastry going on here, and the rest they say, is history. As for your current Pisces guy, what you report about “passion” running high between you two makes sense, as his triple conjunction, within only four degrees, of the Sun, Mercury and Mars, opposes YOUR triple conjunction of the Moon, Uranus and Pluto, packed within only three degrees(! )-do we really need to say more? It is of very important note that your Moon, at 19 Virgo, opposes his Sun, at 18 Pisces, and aside from the conjunction, the opposition is the next best Sun-Moon synastric aspect a couple can have, although the softer aspects can work well, too. Notice that his Saturn opposes your Sun. Hmm, interesting re: my Venus/Mars conjunction only because that is what Cafe Astrology and Astro.com tell me. But since I am a novice at all this I will take your word! You don’t have to clam up. I have been trying for months to get some accurate analysis and I appreciate yours very much. But really , I only have one other question. Does he feel any of this, astrologically speaking of course, or is it all me? He has a very hard time conveying his feelings which leaves me quite confused. As for your current Pisces BF, without a birth time it will be difficult to say for sure what the deal is. He does have the Moon in Capricorn, which suggests that he may be a man of few(er) words than your previous man, who was born on a full Moon in Leo, though also have a significant placement in Capricorn (in his case, his Ascendant). But my guess would be, that just about anyone would be feeling thekind of synastry you two have that I just desrcibed in my last comment. Aside from the Sun-Moon opposition, the mixture of Mars, Uranus and Pluto makes for a very volatile mix! Nothing’s staid and stale with such a combo, that’s for sure. Well all I know is that despite astrology, despite what my friends might say, which was to give him up LONG ago, he makes me feel like no other guy has ever made me feel. The good the bad and the ugly. And I am no young ‘un! I have done charts on Astrodienst. Can anyone tell me how you can tell which planet is each person’s. For instance, our Sun is conjunct Venus. ?How do I tell if its his sun or my sun in a reading? If you’ve gotten charts from Astrodienst they label the charts so you can tell which is yours and which is his. This is if it’s a synastry reading. But if you are referring to a Composite chart (“our Sun is conjunct Venus”) then it is read as the combination of both your energies. In a Composite reading the planets are not assigned to a particular person. Thanks, Nadia. Would you be able to recommend where on Astrodienst (or any other place) where I can see this Synastry if U have all of the relevant information? @SeduceMySpirit Sasstrology offers synastry reports for sale. You can also get a free synastry chart on astro.com by going to free horoscopes > horoscope drawings > extended chart selection, then choose Synastry in the drop down menu. @SeduceMySpirit if you’re truly looking at a synastry chart, you look at who is represented by the inner wheel and who by the outer wheel. So i have neptune opp sun, moon, merc and mars natally. Any planets conjuncting Sun, Moon, Merc and Mars will oppose my Neptune. My Saturn is opposite my North Node and my MC. So any planet conjuncting NN or MC are opp Saturn. Planets trining Sun, Moon, Merc and Mars are conjuncting Pluto, or squaring Saturn and Squaring venus. I need different people around… I guess i need to learn something first… gosh sometimes yourself is complicated. Apparently i need to know how to handle my long term planets first. The transits are mirrored in the people around me, which is kind of ironic or funny when you start to see it. Well i actually have a question about that. I think a lot of people will have to deal with that right? If this is what is keeping you from a meaning full relationship. All relationships have difficulties. No matter how many fantastic synastry contacts there are there will always be challenging ones as well. However, the challenging aspects do not have to be deal breakers if there are enough supportive aspects to balance things out. So if you look at the challenging aspects in isolation they seem overwhelming but no aspect should ever be interpreted by itself when you are reading a person’s chart. Mine: born 15 november 1982, 10.30am, jakarta,Indonesia. His: born 30 July 1990, time unsure, at Semarang Indonesia. Your kindness is highly appreciates. Thanks. (Aspects not withstanding) Traditionally, Saturn in VIII is in well stead (every other celestial body, let’s not discuss)… there’s this Cap girl, with Saturn in Aquarius in domcile; her Saturn overlays my VIII (Aqua on the cusp)… there’s me, Saturn in Gemini dignified by triplicity rulership; my Saturn visiting her VIII (Taurus on the cusp)… do you see my problem? I totally agree with conjuncts to the IC… but, why does Patty have father issues?… traditional/classic stance maintains IV is the Father or Both (as per your Ptolemic interpretation and/or Arabic parts) while moderns maintain it’s the mother… with water houses you were inclined towards the modern-ers; with the IC, a traditional outlook… why? After reading this article I now know why the relationship that I’ve had with a particular scorpio has been so tumultuous for me: his scorpio sun, venus, and mars all land in my fourth house which is ruled by scorpio. My mommy/daddy issues and childhood insecurities came up BIG time over the course of our relationship. I’ve experienced trouble in letting him go because my sag venus and scorpio uranus also lands in that house, it’s like I’m almost comfortable with the crazy because it’s familiar. Still I hate the drama too. Oh, I wanted to add one more thing: his cancer saturn falls in my cancer ruled twelfth house, which in addition to the fourth house aspects triggered my fears about relationship, issues with my mother, etc. Being a Sag sun and venus with an Aqua moon, I cannot begin to tell you how frightening it was to deal with all that emotion. What I’ve found though is that because I have my jupiter in cancer, that I was able to learn from this experience and have begun to heal the childhood scars. Not sure what you mean about me choosing to break away from traditional rulers…do you mean the natural rulers of the 4, 8 and 12th houses? Some astrologers may identify the 8th and 12th houses as unfortunate but I do not. They are intense, emotional houses which represent subconscious and instinctive impulses. This makes them challenging to deal with but they only become negative when a person is unwilling to deal with these issues or is unaware of them. Re: the Cap girl and your mutual 7th house overlays…..you’ll need to clarify what you feel the problem is. Re: the IC ….it represents childhood and can represent both parents (it encompasses all aspects of childhood). I’m glad the article gave you some clarity. Jupiter will be extremely helpful to you as it will lift you up when you start to get overwhelmed by all the drama of the water houses. I have recently encountered a couple who both have Saturn in mutual reception with each other’s Sun signs; i.e., He is a Virgo and she is a Cancerian; his Saturn is in Cancer and her Saturn is in Virgo. I have never encountered this before – what do you make of it? It seems like some pretty strong glue to hold a couple together. Mutual reception for any planets is nice in synastry because it gives a couple a common understanding regarding the energy of the planets involved. Saturn in Cancer often indicates someone who did not receive enough nurturing in childhood or is missing that feeling of being loved. Her Sun in Cancer could fill this void for him and he could offer her structure and stability (Cancer likes to feel secure). Saturn in Virgo emphasizes the prudent, careful aspects of Virgo so he, being a Virgo, would understand this part of her. Of course, if Saturn is challenged in either of their charts this mutual reception could compound the problem but even challenging aspects to Saturn can be very binding. Okay. One more thing – they each have Saturn conjunct the other’s ruling planet in its own sign. ie, His Saturn in Cancer exactly conjuncts her Moon in Cancer, and her Saturn very closely conjuncts his Mercury in Virgo. Would you say this is super-glue? There does seem to be one fly in the ointment – they have Mars exactly square Mars. Do you think this is a significant obstacle? All Saturn aspects have the potential to act as glue. As for Mars square Mars….it can lead to a lot of disagreements but certainly does not have to be a deal breaker. What do you think of a YOD or Boomerang in composite, in terms of “fate”, or at least significance? You mentioned earlier that a mystic rectangle, by itself, does not indicate fate. Thanks for posting this Nadia. I have been worrying about reading relationships lately and have been doing it all over the place. Thanks for giving emphasis on synastry. His scorpio moon conjunct to the exact degree to my IC. Priceless indeed. And as if to intensify this heady mix, his pluto conjunct my mars to the degree in virgo. We can’t help but be passionate about things, regardless the time of day or night…..
We have four out of the five connections as stated above. And more. The relationship itself is like a quicksand for both of us – there simply is no way out. We go through emotional extremes, which can be quite exhausting. At one point, we mutually desired to end the relationship, thinking that it has ran its course. We fell in and out of love with each other so many times, but we can’t afford to stay away from each other. The glue in this case totally worked, having a rare Saturn opposition to boot. The constant need to get away is due to emotional exhaustion, not boredom nor infidelity issues. It’s like getting this burnt out feeling after a period of intense and deep emotional/physical connection. The pattern I have identified however is that a transit moon square any of our natal mars tend to trigger a few days of emotional instability. If the question is – shall we trade each other for different individuals, then the most likely answer is no. We are both mentally, emotionally and physically engaged with each other’s persona so much so that we can fall in and out of love with each other a thousand times and barely notice it. I hope I make sense when I say that astrology can entice you and can also imprison you. I have a question. Which aspects can be considered as deal breakers in a relationship? What about mutual north node conjunctions to IC? I can’t find much info on that. Please someone let me know! Thanks. Does having my Saturn opp his uranus and my neptune square his venus and mars mean a short lived relationship even though all other aspects in our charts (mars con venus and mars con mars) show. My birthdate is Nov 16, 1962 in Lublin Poland 9:30 a.m. and his is July 11, 1957 1:00am in Edmonton, Alberta. hi, Nadia, you mention that saturn’s contact to an angel also have the similar staying power as contacting the plants. I have my ascendant sqaure another’s saturn. would saturn want to keep the relationship? I know I do! Although some say that the angular person would feel the aspect more, and square is about confrontation, but so far I haven’t felt anyway limited from this relationship. what do you think the saturn would feel about squaring the ASC? As I have done my synastry with my husband, at http://www.astrowin.org/scripts/synastry_chart_pdf.php for free, I was devastated, because it gave us a -45 points.. and it says, look for a +30. And its true, we do have our problems, but we love eachother. So when you said that its the Composite taht will keep two people together, that gave me a LOT of hope.. Please let me know how do I know that? And if our composite can really overcome our scary synastry (i dont get it we do have mutual sun/mars conj, and sun/moon aspects, STILL its -45 🙁 ..